The Adventure is Over, But the Party is Just Getting Started! Heroes spend days on end slogging through dirt and muck while risking their lives battling nasty creatures. A stay at a clean and (relatively) safe inn or tavern can be a much-needed reprieve from their daily grind. Inns and taverns are common fixtures in roleplayig games, but often, a stop at the inn is little more than a pause in the action, allowing player a few moments to erase damage on their character sheet. 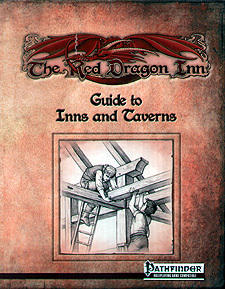 The Red Dragon Inn: Guide to Inns and Taverns is a companion sourcebook for filling your games with detailed and imaginative places for their heroes to eat, drink, and be merry. This book goes a step further (well, actually a number of steps). Crammed inside you'll find information on running, stocking and even building inns and taverns. You'll also find new player and NPC classes that allow you to create the sort of folks that you'll find in these places. And, of course, there will be gambling, with new mechanics that support everything from a simple game of cards to betting on gladiators. The nuts and bolt for building structures from the ground up, including how much it costs, how long it takes, and how easy it'll be to tear it all down. New classes, feats, traits, spells, equipment, and magic items.